Automatic Standings Update. There have been numerous requests for this feature. Standings are updated when game scores are marked ‘final’ on the Manage Games or Update Games screen. 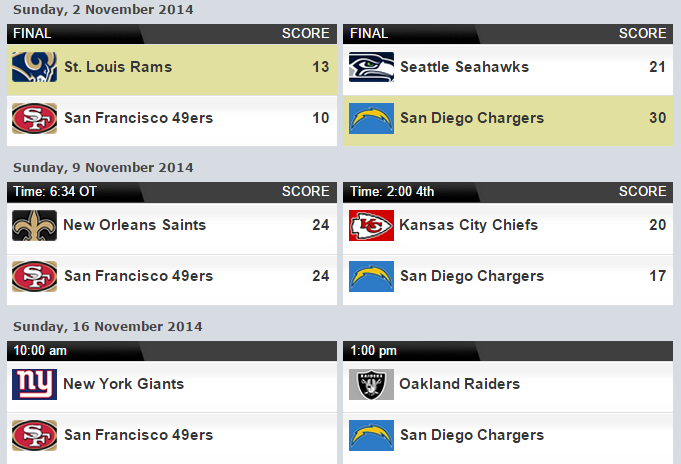 So you may not have to update the League Standings, just the games. Standings can still be edited for those who may not track games and scores. Update Games Screen Pagination. If a league has too many games, then the Update Games screen has too many data fields, and limitations built into WordPress prevent updates to the games on this screen. (They can be updated via the Manage Games screen.) Paginating the Update Games screen fixes this problem. 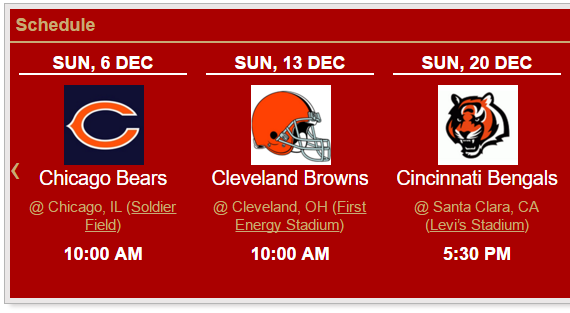 Improve the Schedule Slider(s). Make some cosmetic fixes and (hopefully, no promises) improve responsiveness. If you are having problems with the sliders on small screens, you might want to try the WP Mobile Detect plugin. One user has reported good results with it. Add Colors to Team Data. This will allow some easy (no CSS) branding of front end displays with team colors. It will also increase integration of the MSTW plugins. For example, Team Rosters can use teams in the League Manager database. Documentation & Help. Add Context Sensitive Help to all admin screens and update the users manual. What else would you like to see in MSTW League Manager? Let me know as soon as possible since I’m starting this work soon. The MSTW Tournament Bracket Builder Premium is the leading WordPress plugin for creating and managing tournament brackets. Nothing else comes close! 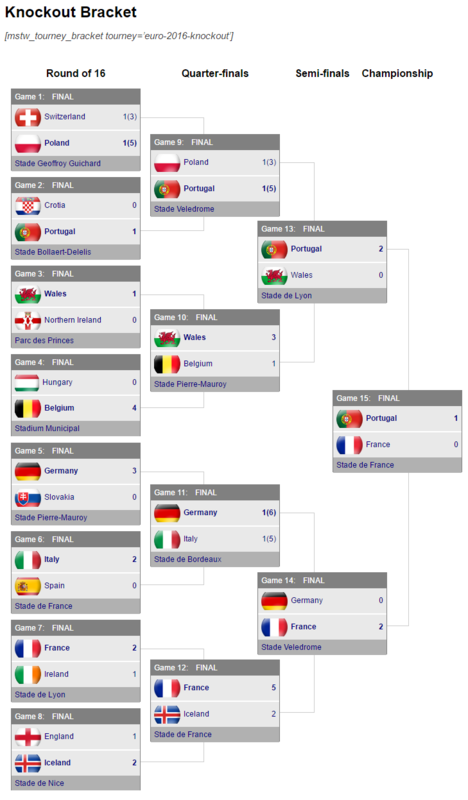 Simply and easily build tournament brackets (knockout rounds) and game schedules (fixture tables). The automated admin process lightens your workload, and the simple shortcodes will make your site pop. See how easy it is in this short video! Your purchase includes one year of free upgrades, and access to a full users manual, video tutorials, and a dedicated community support forum. Create single or double elimination brackets of 4, 8 or 16 teams. Customize front-end displays using a large set of display options, and with custom CSS styling. Schedule the 1st round by established seedings or with user-defined game pairings. Advance winners – winner is advanced to next round when game goes final (as well as first-time losers for double elimination brackets). Did we mention your purchase includes one year of free upgrades, and access to a full users manual, video tutorials, and a dedicated community support forum? This is a call for some debugging and test assistance. If the following makes no sense to you, nevermind! It is only a problem for some premium themes, which is way I’m asking for help. If you have experienced the long-standing problem with the the Team Rosters plugin messing up the Featured Images (aka “Thumbnails”) for posts on your site, I MAY have found a fix. If you would like to try it out, you can download it from the plugin’s development tree. You only need the mstw-team-rosters.php file. If you do try it out, please let me know how it works on your site. You can now purchase logo sets for your favorite leagues at the the MSTW Store. Countless hours have been invested in building logo sets for testing the MSTW plugins. Why re-invent the wheel? 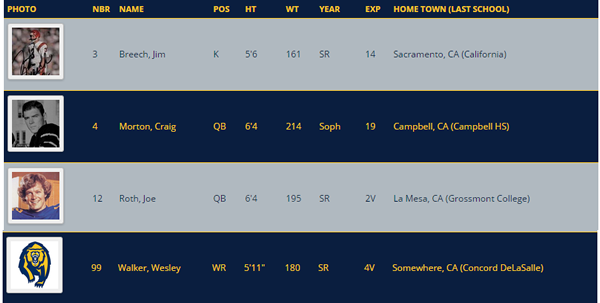 Whether you don’t have the graphics skills, don’t have the interest, or just don’t have the time, you can jump start your website’s database of teams with pre-sized logos for MSTW schedule tables, standings tables, and scoreboards (41×28 px) or player profiles, team galleries, single game pages, and schedule sliders (125x125px). 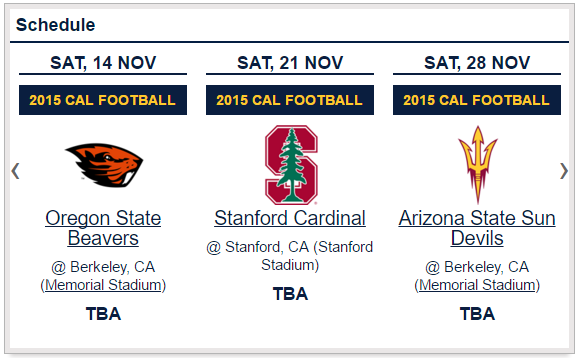 All NFL, Pac-12, and Big-10 teams are available now. More NCAA Leagues, MLB, NBA, NHL, the Premier League, Euro-16 team flags, Olympic team flags, and more will be available in the near future. If there are team logos you need soon, feel free to contact me. More examples are available on the MSTW Development Site. You are purchasing only the labor expended to convert the images to the optimal sizes for the MSTW plugins. At least one 41x28px and one 125x125px image. NO RIGHTS TO USE THESE IMAGES ON YOUR SITE ARE GRANTED OR IMPLIED. You must obtain the rights necessary to use each image on your site, which depends on your site (personal, commercial), and the organization owning the rights to the image. MSTW League Manager 1.1 Now Available! 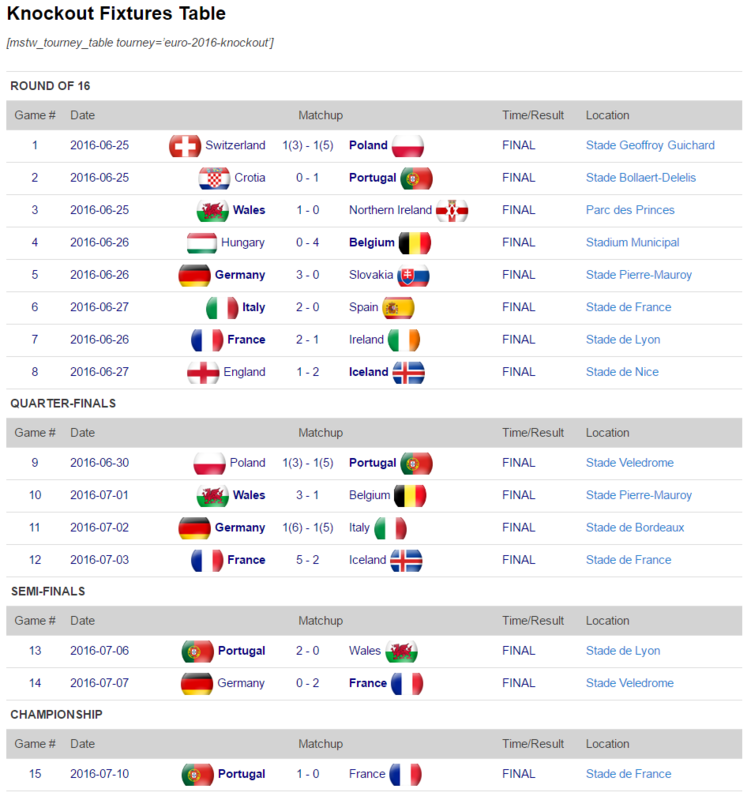 MSTW League Manager version 1.1 is now available on wordpress.org. Check it out in action on the MSTW Dev site. Added links from standings table fields: Team Name to Team URL or Team Schedule, and Next Game to Single Game Page. 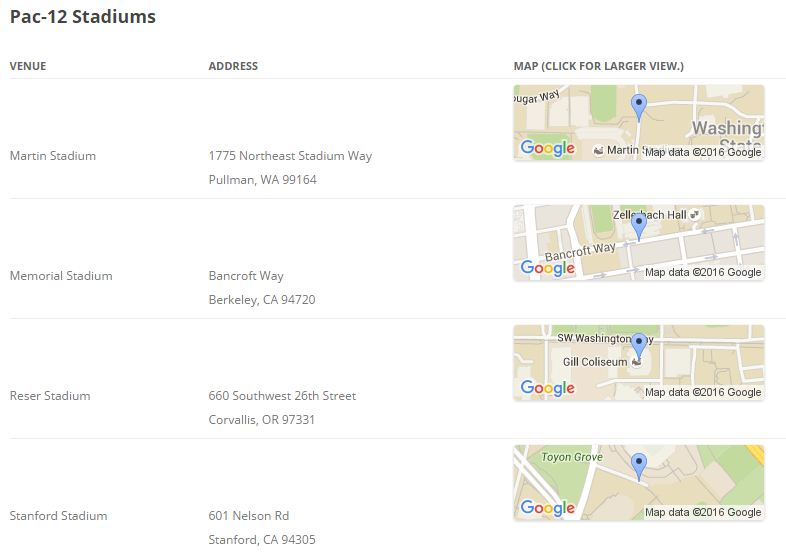 Added links from schedules table, team schedule table, and schedule gallery fields: Team Name to Team URL or Team Schedule, Location(Venue) to Venue URL or Google Map, and Game Time/Result to Single Game page. Added a show_home_away argument to the mstw_team_schedule shortcode, and .home-game and .away-game class tags to the team schedule tables. 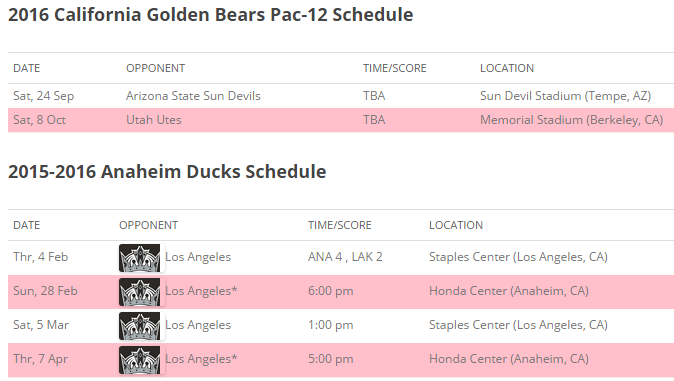 Combined, these two additions provide flexibility in displaying home games in a team schedule as shown below.